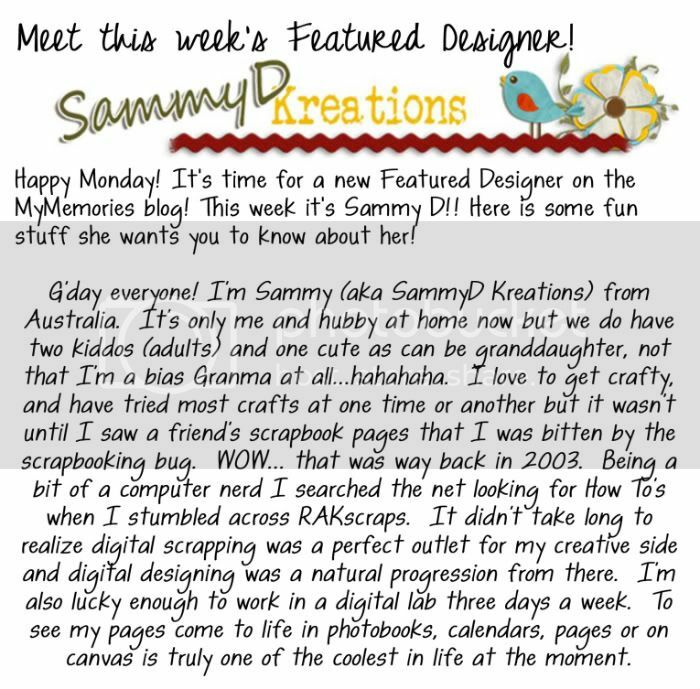 MyMemories Blog: Meet this week's Featured Designer, *SammyD Kreations*! Meet this week's Featured Designer, *SammyD Kreations*! Check out some of the *Amazing Designs* in the MyMemories.com Design Shop from Sammy D! She is giving away ONE $30.00 shopping spree and TWO $10.00 prizes from her shop to a few lucky winners!! Please leave a comment below and tell her what YOUR favorite kit is and you are entered to win! A *very* special CONGRATULATIONS to Raelynn (in Illinois) and Jen Bagley - you were BOTH selected to win the WHOLE SHOP from *A-Manda Creations* - last week's Featured Designer! Please send an email to LisaJ@MyMemories.com to get the information you need to claim your prize! Congrats to Raelynn and Jen Bagley for their awesome win last week. Can't wait to see your pages! My favorite would be Outdoor adventure and Funtime. Thanks for the chance to win. I really like your Outdoor Adventures kit along witht he Juas a Man kit too! Thanks for the chance to win! I love your stuff! I downloaded the Time for Play QPs and I've already used and printed them off!! It was the perfect canvas for my son's playdate with schoolmates!! Thank you for the chance to win! All of your stuff is really cute, my favorite it the whole set of the Just A Man Kit, & I really like the Funtime kit as well. Thanks for the chance to win some wonderful stuff. Um - Your designs are beautiful. The Just a Man collection is great and Outdoor Adventures and the Simple Life and Play Time are all wonderful. In truth it is hard to pick one favorite! Probably Just a Man or Outdoor adventures. I have two boys and a hubby so lots of boy photos. I love the Simple Life or Just a man! So many beautiful kits! Hi Sammy, I will enjoy your designs, when I can get some. Found my favorite first thing, Long Hot Summer. I spent the weekend looking for a pair of sunglasses for a pg I want to do, and you have one!!! So exciting! It's so nice to meet you. My dream is to go down under! I'm so excited your from there. I appreciated this opportunity to met you and look at your store. What great kits you have. I found a few I love, Back to nature and love u Mom kits would nice to add to my connection! I love your design packs. I'm just starting and they are great. Fun to learn a little about Sammy. I think I like the "Time to Play" kit. It reminds me of my childhood when we had a big tree with a tire swing. Digital scrapbooking is new for me having just purchased MyMemories Suite 2 just a couple of weeks ago and last week I bought one for my daughter that got married, Sept 10th. There are six kits I really like and will probably order 2-3 of them but the one that will be the most useful for me this week is Luv U Mom. My mother will be turning 94 years on Nov. 7th and creating an album would be a good way to honor her (and my dad who is 92 years). Congrats to Sammy for the guest DT spotlight! I am loving just a man & funtime! Thanks for the chance to win some awesome goodies! Outdoor Adventures would be the best fit for us, I have boys. But I think they are all lovely. There are a few I'd be interested in getting. I love Funtime!!! :-) You have some very nice designs here! hi, my favorite kit is charlotte, i think you put a lot of thought into this kit and it is just beautiful. it was interesting to hear you're from australia, i've always thought it lovely from the shows on tv. keep doing these lovely kits. This was a tough choice but I do really like Outdoor Adventures. Thanks for the chance to win! Thx for this lovely chance! My fave is Outdoor adventures. Love your stuff the outdoor adventures I think is my favortie but it's a little hard to choose. Hard to choose, you have a bunch of really cute designs . . .I'd have to go with Long Hot Summer. I like Just a Man and Time to play. So many great choices though! Hi- I like Time to play and outdoor world! My favorite is Long Hot Summer: & thank you for a chance to win. Love all your packs! I think my favorite would have to be tide of life---love the colors in it! I like "One perfect day" and "so adorable". Nice stuff in your shop, love Simple Life! Just added it to my wish list..
Love, love, love "Time to Play"! It's just a gorgeous kit! What a great life, entertain your mind and our souls!! Thanks for all your creativeness and wilingness to share with all of us! I like charlotte it has lovely papers & embellishments but there is so much to choose from ,i have already bought a digi kit from my memories and its great ! Cute kits! I really like Outdoor Adventures and Charlotte. i like family traits the best, but there are several others that are close seconds on my wish list. thanks for the chance to win. i'm new to digital scrapping so i'm on the lookout for tutorials and ideas. Love to see new designers and their beautiful artwork! All your kits are amazing! My favorite would be Just a Man. love a perfect day and charlotte. Oh so many kits that I would love to add to my stash....I guess my favorite would have to be Long Hot Summer, especially the word art! It's not always easy finding kits for the men in our lives. Just a Man would have to be my favorite in Sammy's design collection, although they're all unique and fabulous! Hi Sammy D! I like Ain't Mis Behavin. It would be great for hubby and I. Thank you! I have 4 grandkids who live in VT, country, obviously! Outdoor Adventures would be my favorite kit. Fits their lifestyle perfectly. Thanks so much for the chance to win! My favorite kit is "Just a Man" I've got a house full of boys, so I always appreciate a good, versatile boy kit! I just downloaded the program last night and would love to win one of your packages..Can't wait to play with this digital scrapbooking program...I really love Tide of Life, Simple Life, Just So Adorable and Charlotte...what a fantastic giveaway..
My favorite is Tide of Life. I'm new to digital scrap-booking and I definitely have been bitten by the bug. I love the Outdoor Adventures group. Your color palettes are wonderful. Thanks for sharing your talents with us! I love the PlayTime pack. It is so cute with lots of bright colors!! Definitely need that Long Hot Summer kit and extras!! Such cute stuff. Wow,it's hard to choose ... I really like Simple Life, the colors appeal to me. Thank you for the chance to win. Your stuff is wonderful. Hey, thanks for the chance to win! I love "Just a Man"! I don't get to use any of the cute, pink, frilly stuff. I'm surrounded by boys! OK....I'd have to say You & Me is my favorite! They are all very nice and I love the colors you use....Thanks for a chance to win!! Ain't Miss Behavin is my favorite design pack - thanks for the chance to win! I think Outdoor Adventures would be great for my boys and my daughter, too. I love Outdoors Adventures. I have scouts so we do a LOT of camping! Thanks for the chance to win! I have an almost 1 year old granddaughter. If I were to win the shopping spree, I would purchase the 'Just So Adorable' kit. It would be perfect. Thank you for your generous offer! They are all lovely but my fav is Time To Play! I am loving Long Hot Summer but they are all very nice. My triplet girls are turning 13 this weekend...their big brother is 14. I'm noticing teens are a lot like toddlers...never a dull moment, mentally exhausting. That's why my favorite kit is "getaway". Every good mom deserves a break! I think the kit I like best is "Charlotte" I'm guessing that maybe that might be your granddaughters name. (I have granddaughers as well) I LOVE the ribbon wrapped frames and I really like the paper in this kit as well. Your are very talented. I love a lot of the kits but I think Charlotte is my favorite...so sweet for my granddaughters. Thanks for a chance to win. I love them all! What great designs - I love the 'drawings' templates, looks like chalk, how fun. I'm thinking the Outdoor Adventures kit would be good for my 3 Boy Scouts and their outings, and maybe the Just a Man kit. It's so hard to choose just one! Thank you for the chance to win!